Although descriptions of the pineal gland date back to antiquity, its functions in animal kingdom including human are poorly understood (Macchi & Bruce, 2004). The pineal gland is still a mystery largely related to its small pea size, particular shape, location which is deep within the brain, and being an unpaired single structure in the midline (Berhoumaa, 2013). Although for a long considered to be an insignificant rudiment of phylogeny, it is now established that pineal is a secretory organ (endocrine function) and is intimately related to photoperiodic information. It communicates with the body through melatonin and other neurohormones to establish a chronobiological alignment of internal rhythms (Berhoumaa, 2013; Ekström & Meissl, 2003). It is an important contributor in what we perceive beyond our conventional five physical senses. However, such perceptions are ambiguous and difficult to quantify and qualify. Science as well as contemporary philosophies have diverse interpretations with little agreement on them. In our opinion, the divergence is more because of different ways of interpretation of the issue and beliefs rather than desire to learn from each other's experience to find an answer. This review is an attempt to evaluate the anatomical and physiological significance of the pineal gland, philosophical and religious view on soul, scientific correlation between the gland and soul, and author's interpretation on it. Living organisms, both invertebrates and vertebrates, adjust to seasonal and environmental changes (e.g., photoperiod, temperature, rainfall, and food supply) and regulate physiological functions (Vivien-Roels & Pevet, 1993). They use photoperiodic changes to initiate these physiological processes. Galen (ca130–210), a Greek physician, is credited with first detailed description of the pineal gland and he coined it as konareion (Greek meaning “pineapple”) because of its resemblance to nuts found in the pine cone (López-Muñoza, Rubioc, Molina, & Alamoa, 2012). Before Galen, this gland was considered as purely a mechanical valve regulating the flow of the psychic pneuma (spiritus animalis) between the middle ventricle (3rd ventricle) and the posterior one (4th ventricle) (Ekström & Meissl, 2003; Rocca, 2003). It was first referred as the pineal gland in the 1680s, from the French pineal (Latin pinea which means “like a pine cone”). Other workers have argued that its name came after description given by French psychologist, Philippe Pinel. In lower animals, the main function of the pineal gland is photoreception and regulation of circadian rhythm (Macchi & Bruce, 2004). Photoreception function of the pineal gland in evolution has been relegated gradually to the retina in the eye in mammals (Macchi & Bruce, 2004). Photoperiodic responses which gradually developed to stable circadian or chronobiological rhythm have been relegated to suprachiasmatic nuclei (SCN). Aaron B. Lerner et al. at Yale University, America, in 1958 recognized the endocrine function of the pineal gland and isolated the hormone melatonin (Ekström & Meissl, 2003). While endocrine and secretory activity of the pineal gland is fairly understood, its relationship with soul continues to be associated with controversy. It has been regarded as a “mystery” gland with mystical, metaphysical, and occult theories surrounding its perceived functions (Macchi & Bruce, 2004; Berhoumaa, 2013). Rene Descartes in the 17th century identified pineal gland (epiphysis cerebri in mammals) as the seat of soul (Macchi & Bruce, 2004; Ekström & Meissl, 2003; Sengupta & Tosni, 2017). The dualistic philosophy of Descartes relies on a clear-cut distinction between the mental substance which is immaterial and unsolvable by physics or mathematics (Res cogitans) and the corporeal substance which is incapable of thought and subject to the laws of nature (Res extensa) (Berhoumaa, 2013). Scientists consider pineal to be the master gland, “the regulator of the regulators” which ensures proper biorhythms of the hormonal and cellular systems. The pineal varies in size among species; in humans, it is roughly 1 cm in length, whereas in dogs, it is only about 1 mm long. The diencephalon in all vertebrates developed from the roof of the prosencephalon of the developing neural tube. The epithalamus is a posterior (dorsal) segment of the diencephalon. It is densely connected with the limbic system, basal ganglia, and other parts of the brain. It develops in to the retina, epithalamus (pineal body, habenular trigones, stria medullaris, and roof of the third ventricle), thalamus, subthalamus, metathalamus (medial and lateral geniculate body), hypothalamus, and pituitary gland in the adult brain (Macchi & Bruce, 2004; Sengupta & Tosni, 2017; Purves et al., 2012). In humans, the pineal gland is crucial to the healthy functioning of our physical, mental, emotional, and spiritual body. It is the only unpaired (azygous) organ in the brain located exactly at geometric center of the brain at the end of the third ventricle just above the midbrain colliculi in the roof of the diencephalons [Figure 1] (Descartes, 1991). In human, it is a tiny, reddish-gray pea-sized endocrine gland and weighs approximately 100 mg (Wu & Swaab, 2005). It has profuse blood supply second only to the kidney in the human body. SCN, situated in anterior hypothalamus, is the major circadian pacemaker of the mammalian brain and plays a major role in the generation and regulation of biological rhythms (Wu & Swaab, 2005). It is capable of measuring the length of the dark/light. 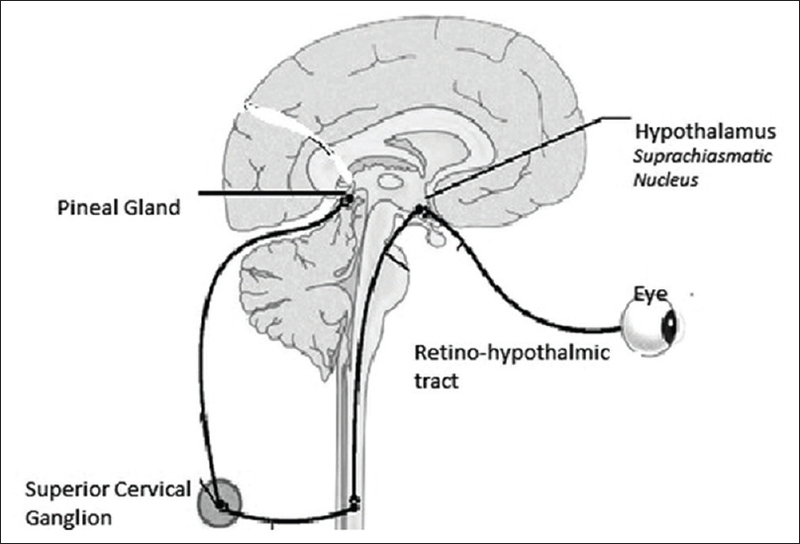 Light perceived by the retina reaches the SCN through the retinohypothalamic tract [Figure 2]. Some light information from the retina also reaches the SCN through the lateral geniculate body. From the SCN, there are inhibitory signals to the paired hypothalamic paraventricular nuclei (PVN). From PVN, long descending axons project to synapse on preganglionic sympathetic neurons in the intermediolateral cell columns of the upper thoracic spinal cord. These descending fibers ultimately project to the superior cervical ganglia. From there, postganglionic sympathetic axons reenter the cranium and innervate the pineal gland. Abundant evidence indicate that sympathetic stimulus is crucial for melatonin secretion in humans. The SCN and melatonin are synchronized to the 24-h day by environmental light (Wu & Swaab, 2005). Parasympathetic innervation is very small and comes from the sphenopalatine and otic ganglia (Møller & Baeres, 2002). The physiologic significance of parasympathetic input to the pineal is unknown. The main output of the pineal gland is melatonin through which it communicates with the rest of the nervous system. 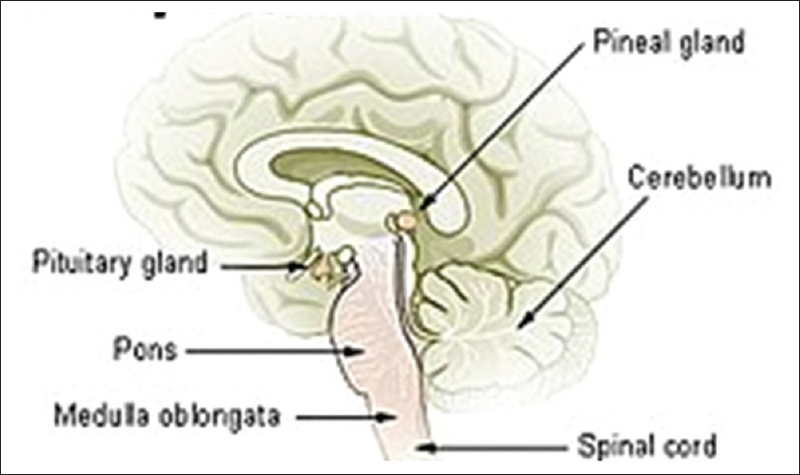 Although a gland, the histology of the pineal gland closely resembles the structure of nervous tissue. It consists mostly of pinealocytes and glial cells surrounded by a layer of pia mater (Wu & Swaab, 2005; Herring, 1927). Its cellularity is much greater than that of normal white or gray matter of the brain. However, it contains no true neurons (Herring, 1927). Pinealocytes or primary pineal parenchymal cells are of a similar lineage as the photosensory cells of the retina and found only in the pineal gland. Glial cells are primarily astrocytic with a small number ependymal cells and choroidal cells. Pineal parenchyma typically contains a variable quantity of calcific particles, called corpora arenacea (“brain sand”). These mineral particles are deposited throughout the life, and weight of the gland increases gradually from puberty onwards. Fluoride can accumulate and calcify in the gland decreasing its effectiveness as we age. In addition to fluoride, other halides such as chlorine and bromine also accumulate and damage the pineal gland. Pineal bodies are found in almost all vertebrates (Oksche, 1984; Wikipedia). There is a dramatic change in its structure and function with transition from direct photosensitivity (characteristic of nonmammalian vertebrates) to indirect photosensitivity (characteristic of mammals) during evolution (Ekström & Meissl, 2003; Falcon, 2009; Sengupta & Tosni, 2017; Sapède & Cau, 2016). The organization of the pineal in nonmammalian vertebrates resembles the vertebrate retina, albeitwith much less complexity (Herring, 1927). Pineal is the first gland to be formed in the fetus and arises during the 7th week of gestation. This primitive area in the mammalian brain is occupied by two distinct structures, i.e., anterior or parapineal organ that gives rise to the parietal eye and posterior or pineal organ that gives rise to the pineal body of the higher vertebrates. It has been observed in lizards that parietal eye component is related to latitudes with high prevalence near equator. It reaches its highest degree of development in certain reptiles and has been regarded as a third or mesial eye (Herring, 1927). The parapineal organ is not represented in the higher vertebrates including in the mammalian brain. While in earlier animals, it is a paired structure, a single pineal is formed in turtles, amphibians, snakes, birds, and mammals (Wikipedia). The gland's orientation also changes from vertical to horizontal (Macchi & Bruce, 2004. The weight and the volume of the pineal gland show big differences within and between the species depending on the time of year, age, and the physiological status of the animal. The volume of the pineal gland tends to increase in line with increasing body weight. The human pineal gland grows in size until about 1–2 years of age and reaches its adult size by age 4 years. Although large in children, it begins to shrink with the onset of puberty. Throughout adult life, there is a gradual decrease in melatonin synthesis and release. Pineal volume does appear to correlate with variations in hormonal activity (Macchi & Bruce, 2004). Species with larger pineal tend to be homoeothermic (vs. heterothermic) and to have diurnal physiologic cycles (vs. nocturnal). Tropical animals tend to have smaller pineal than those adapted to living in temperate climates. This gland in human maintains its weight and ability to produce enzymes into the eighth decade (Macchi & Bruce, 2004). Circadian rhythms of pineal excretion are not affected by aging or senile dementia. However, 24-h mean melatonin levels are half as great in the elderly as in the young. Several reasons for this decline have been suggested, for example, (1) changes in release of the hormone, (2) an increase in metabolism or excretion, (3) an increased sensitivity to light in the aged, or (4) decreased or nonresponsive pineal beta-adrenergic receptors. Of the endocrine organs, the function of the pineal gland was the last discovered. This gland translates nerve signals from the sympathetic nervous system into hormone signals. In addition to melatonin, the pineal gland also secretes serotonin and norepinephrine. Pinealocytes also contain significant intracellular concentrations of other hypothalamic peptides such as thyroid-releasing hormone, luteinizing hormone (LH)-releasing factor, and somatostatin. Its major functions are summarized below. Melatonin acts as a chronobiotic molecule stabilizing or re-enforcing the circadian rhythms of body functions in mammals (Sengupta & Tosini, 2017). Sleep is an ancestral and primitive behavior, an important part of life thought to be essential for restoration of body and mind. Melatonin, whose secretion increases during night, has a significant effect on sleep pattern. The quality of sleep declines drastically with aging correlating with decline in nocturnal levels of melatonin (Wikipedia). Another major function of melatonin is to regulate sexual development, primarily by delaying the onset of puberty. It also plays a major role in metabolism, seasonal breeding, and hibernation in animals. The pineal gland, through the inhibition of secretion of the gonadotropin-releasing hormone from the hypothalamus, decreases release of pituitary gonadotrophins, for example, follicle-stimulating hormone and LH. As people age, the pineal gland tends to secrete less melatonin. However, it is unlikely that melatonin is the sole culprit for age-related changes. At nighttime, when melatonin levels are high, blood pressure, heart rate, and cardiac output are lower (Jain & Bhatnagar, 2007). Melatonin enhances immune system function and has antioxidant activity. It suppresses growth and metastasis of some tumors (Sapède & Cau, 2013). Its supplements may protect against postmenopausal osteoporosis. Role of melatonin is under investigation in many neurodegenerative diseases, autism, and depression. Environmental stresses affect pineal function, impacting overall body alertness and hormone operation. Stresses that affect pineal function include unusual light and dark rhythms, radiation, magnetic fields, nutritional imbalances, temperature swings, high altitude, and overall daily stress patterns. The pineal gland is known to secrete a endogenous psychedelic called N, N-dimethyltryptamine. It is present throughout nature, in plants, animals, and humans. It is produced in large quantity during rapid eye movement sleep and perhaps involved in production of dreams. Some drugs, both recreational and prescription one, appear to alter the function of the pineal gland and change melatonin secretion patterns. One study concluded that the pineal gland could play a significant role in addiction to cocaine and other psychostimulants. In birds and other animals, the pineal gland has a magnetic material and is therefore the navigation center in them. Its impairment is associated with declines in the sense of direction suggesting its important contribution to spatial navigation. Scientists are looking at magnetic and navigatory properties of the pineal gland in humans. All organisms, from unicellulars to vertebrates, are tuned in time as well as in space. Circadian rhythms are defined as biological rhythms with an intrinsic periodicity of approximately 24 h. The central (endogenous) circadian pacemaker is a robust regulator of daily rhythmic variations of neural, endocrine, and cardiovascular physiology. Environmental lighting is powerful modulators of circadian rhythms. In all vertebrates and most mammals, this “circadian axis” consists of the retina, the pineal gland, and the SCNs of the hypothalamus. SCN, with a high density of melatonin receptors, is the primary circadian pacemaker in them (Macchi & Bruce, 2004; Vivien-Roels & Pevet 1993). Another center for melatonin production is located in the retina. The rhythmic production of melatonin is under control of endogenous oscillators and photoreceptor cells (Korf, 1994). Studies have demonstrated that there are numerous semi-autonomously operating clocks reside within a single mammalian organism (Stratmann & Schibler, 2006). These clocks are distributed among most organs and tissues of the body and are organized in a hierarchical fashion. Researchers are now looking for the exact location(s) of this clock in the human eye. Melatonin is a very ancient hormone found throughout the animal kingdom from algae to humans (Jain & Bhatnagar, 2007). The ontogenetic data suggest that, in lower vertebrates, its biosynthesis is primarily controlled by intrapineal photoreceptors, whereas in mammals, it depends on retinal photoreceptors and the sympathetic innervation of the pineal (Vivien-Roels & Pevet, 1993; Korf, 1994). Its extrapineal sources are retina, gonads, bone marrow, white blood cells, platelets, skin, Harderian gland, cerebellum, and gastrointestinal tract (Vivien-Roels & Pevet, 1993). In human, secretary activity of melatonin varies throughout the course of development. Its serum levels increase from the third postnatal month to preschool age. They then decline steadily from preschool age until sexual maturity. Pinealocytes have a characteristic capacity to synthesize melatonin on a 24-h schedule (Klein, 2006, Emet et al., 2016). Its level begins to increase steadily after 1900–2300 h to attain the peak values at around 0200–0400 h signaling the body the duration of the dark period. Rhythmicity of melatonin secretion also provides information about the season of the year and influences biological and behavioral changes in response to the changing seasons. Light is the dominant environmental factor that regulates melatonin biosynthesis in vertebrates (Sengupta & Tosini, 2017). Light, irrespective of whether it is full spectrum white light, monochromatic light, or ultraviolet-A light, exerts a suppressive effect. Blue light (446–477 nm) is the most effective in suppressing melatonin production. A recent study showed that shorter wavelength blue light (18 lux) is significantly more potent than the long wavelength (red) and middle wavelength (green) light (Holzman, 2010). Synonyms: Parietal eye, third eye, pineal eye, and eye of Horus. Both Eastern and Western mystical traditions have attached great importance to the “third eye.” It is presumed by them that the pineal gland holds the secrets to spiritual wisdom, inspiration, and psychic awareness. Unlike other brain structures which are symmetrical and double, pineal gland is uniquely single inside the brain. It is located exactly in centre and situated deep in the brain. These characteristics have led the philosopher to believe in its mystical role with myth, superstition, and metaphysical theories. It is considered a very powerful tool of the soul, “to see,” “feel,” and to “hear” the higher frequency realities. According to theosophy, in ancient time, humans had an actual third eye at the back of the head with a physical and spiritual function (Wikipedia). Over time, this eye atrophied and sunk into what today is known as the pineal gland. When the third eye is activated, some extraordinary experiences are observed such as direct perception, intuition, imagination, visualization, concentration, self-mastery, and extrasensory. Because of its photosensitive function and important timekeeper for the human body, the pineal gland has been named as “third eye” in scientific and in philosophical literature. The third eye is a part of the epithalamus which typically does not see but is photoreceptive in nature and regulates circadian rhythm and hormone production for thermoregulation (Wikipedia). All reptiles and vertebrates that still today have the pineal eye are “cold blooded;” they have an ectotherm metabolism. Modern mammals – which of course have “warm blood” or an endotherm metabolism – do not have a pineal eye. It is presumed to be a connecting link between the physical and spiritual worlds, and one might say the sacred place of extrasensory perception in the brain. There are sufficient scientific evidence that human pineal gland shares many common features with parietal eye of other animals. The third eye was first described in the 3rd century. In 17th century René Descartes called it “The seat of the human soul” based on three reasons, i.e., (i) it resembles an eye physiologically with retina having photoreceptive cones and rods and (ii) this structure can perceive the metaphysical, dreams, altered states of consciousness, etc. Human eye has also been linked to wisdom, knowledge, enlightenment, perceptiveness, and gods and goddesses. The primitive third eye was probably functional before our present two eyes formed and became dominant. Interestingly, both the pineal gland and the two anatomical eyes are ectodermal in origin and develop from common tissue layers of the embryonic brain. Biology recognizes the pineal gland as being the nature's first eye. Thus, labeling it as “the third eye” is a misnomer and in fact it is the “ first” eye in the animal kingdom. The current scientific research suggests that the pineal gland in human is not a vestigial organ. The biological foundation of the mind's eye is not fully understood. Studies using functional magnetic resonance imaging (fMRI) have shown that the lateral geniculate nucleus and the V1 area of the visual cortex are also activated during mental imagery tasks (Wikipedia). The nervous system, unlike any other organ system in the human body, stands at the intersection of biology and philosophy. The former can be quantified and studied; the latter enters the realm of religion, philosophy, and spirituality. The inquisitive nature of human has always contemplated the anatomical location of the soul. Because of ambiguity and diverse mode of interpretation, lot of speculations are there and many of them without any apparent base. Ancient literature considered “heart” as the center of soul (“cardiocentric soul”). With scientific discoveries, brain is now considered as the center of soul (“cephalocentric soul”). However, concept of cardiocentric soul is so deep rooted in lay public that heart continues to enjoy a prime location. People often swear by heart or express their love or hate through heart rather than through the brain. While the physiological function of the pineal gland was unknown until recent times, mystical traditions and esoteric schools have been long conversant with this area. They localized it in the middle of the brain as a connecting link between the physical and spiritual worlds. Considered the most powerful and highest source of ethereal energy available to humans, the pineal gland has always been important in initiating supernatural powers. Development of psychic talents has been closely associated with this organ of higher vision. Activation of the pineal gland has been linked with sense of all knowing, euphoria, metaphysical experiences, and opening of dormant faculties. In next few paragraphs, we will discuss relevance of the pineal gland to soul in different philosophies and religion. As per Hindu mythology and many other philosophies, the pineal gland is the seat of enlightenment and higher consciousness (López-Muñoza, et al., 2012). They believe that this gland was once the size of large cherry and now it has reduced to pea size. The reasons they considered are two folds, i.e., environmental contamination of food and fluids and over-reliance on mechanical gadgets. In Hindu tradition, the concept of the third eye started with Sanatan Dharma where Shiva is suppose to have a third eye (eye of wisdom) and is called “TRIYAMBHAKESHWARA.” Spiritually, while two physical eyes are sensory organs, the third eye is the eye of vision. They attribute the third eye to the pineal gland because of its being single and location in the exact center of the brain. As per Vedic texts, the “third eye” is designed to facilitate communication with the divine power and self-knowledge. The third eye refers to the gate that leads to inner realms and spaces of higher consciousness. The third eye is often associated with religious visions, clairvoyance, the ability to observe chakras and auras, precognition, and out-of-body experiences. As per Hindus and Upanishad concepts, there are seven important chakras in our body which correspond to the seven major glands in the body. Ajna chakra (Sanskrit name Ajna – to perceive, to command) is the sixth chakra, is in the area of the third eye, which is found in the space between the eyebrows (López-Muñoza, et al., 2012; Jain & Bhatnagar, 2007). It is also known as the Brow Chakra, the third eye, the eye of wisdom, the inner eye Chakra, center of intuition or the Command Chakra. Activation of this chakra can be achieved by concentrating at a point in the middle of the forehead. In Hindu tradition, sun gazing has been considered to activate the pineal and third eye. The electromagnetic radiation received by Ajna chakra influences the third eye and pineal gland. The positive and negative forces interact and become strong enough to create “light in the head” (Wikipedia). The bindi applied on the foreheads by the devotees during prayer and by the women in daily routine is also thought to be associated with Ajna. In Buddhist art and culture, the Urna is a spiral or circular dot placed on the forehead of Buddhist images. In Siva Yoga, the power for spiritual progress (samkalpa sakti) is an important element for the realization of the highest end (Sivananda, 2017). As per this tradition, the force of samkalpa sakti is expressed through the pineal gland (piyusa-granthi). Activation of the pineal gland is the key step in psychic, spiritual, and energy transformation processes. According to Jainism, the soul extends to the whole body and is not located at any particular point. The head has all the five senses whereas the rest of the body has only the touch sense. Hence, we expect consciousness to manifest more in the head particularly the brain which is connected to all the sense organs. In this sense, the pineal gland may be the “center” and not seat of consciousness. In fact, all chakras are likely to be centers of consciousness, but the Ajna chakra may be at the top among all chakras. The concept of manas in Jainism is neither a single function nor a single entity (Srivastava, 2010). There are two main constituents of manas, i.e., dravyamanas or substantial (matter or pudgale) and jnana or buddhi (spiritual or Atman). As per Jain tenet, activation of the pineal gland leads to enhancement of knowledge. Some philosophers also call it “Jnanakshu” – the eye of knowledge which is the “teacher inside” (antar guru). There are a number of methods for the activation of the third eye. For the activation to take place, fullest amount of concentration, meditation, and contemplation (ekagrata, dhyan, and tap) are required. Jyoti kendra prekśa (perception of the pineal gland), darśan kendra prekśa (the pituitary), viśuddhi kendra prekśa (the thyroid), and tejas kendra prekśa (the adrenals) balance the flow of the hormones of the pineal, pituitary, thyroid, and the adrenal glands, respectively. By activating third eye, one can acquire “universal knowledge,” a prerequisite for “Keval Jnana” (omniscience). Clairvoyance and Avadhi jnan can be supported if it can be proved that pineal gland is receptor to radiations beyond ordinary light, particularly those which are connected to prana body. According to Jainism, these radiations are of subtle nature and perhaps have not been explored by science as yet. Yogis having clairvoyance capability have control on prana and this quality may be instrumental in developing that kind of power in them. The anatomic seat of the human soul has been a controversial matter of discussion in the philosophical, theological, and scientific fields throughout history with lot of speculations (Wikipedia; Jain & Bhatnagar, 2007; Santoro et al., 2009). It is believed that one-eyed giant Cyclops of Greek myth represents intuition or direct cosmic vision (Santoro et al., 2009). Ancient tuataras of New Zealand still have a functional third eye, also called the pineal gland. Theosophical literature, however, maintains that in addition to its physiological functions, this pea-sized gland is an important psychophysiological center or chakra involved with activities such as clairvoyance and intuition. In Taoism and many Chinese religious sects, such as Chan (the Chinese ancestor of Japanese Zen Buddhism), “third eye training” involves focusing one's attention on the point between eyebrows and the eyes (López-Muñoza, et al., 2012). Till recently, discussion on the pineal gland was dominated by religion and philosophers with scant details in scientific literature. While former designated it as the “seat of the soul,” science considered it simply as an endocrine gland. Both approaches have certain merits and deficiencies. We will put our interpretation and analysis of scientific facts against backdrop of religion in the next few paragraphs. Thus, there is great need to research on pineal gland and related structures correlating science and religion. We gratefully acknowledge critical review and suggestions of Dr. NL Kachhara, Udaipur, and Er Prashant Sanchetee, London. Berhoumaa, M. (2013). Beyond the pineal gland assumption: A neuroanatomical appraisal of dualism in Descartes' philosophy. Clinical Neurology and Neurosurgery 115, 1661-1670. Descartes R. (1991). Principles of philosophy. In J. Cottingham, D. Murdoch, R. Stoothoff, & A. Kenny, (eds). Thephilosophical Writings of Descartes: The Correspondence (Vol. 3). Cambridge, UK: Cambridge University Press. Ekström, P., & Meissl, H. (2003). Evolution of photosensory pineal organs in new light: The fate of neuroendocrine photoreceptors. Philosophical transactions of the Royal Society of London. Series B, Biological Sciences 358 (1438), 1679-1700. Emet, M., Ozcan, H., Ozel, L., Yayla, M., Halici, Z., & Hacimuftuoglu, A. (2016). A review of melatonin, its receptors and drugs. The Eurasian Journal of Medicine 48, 135-141. Falcón, J., Besseau, L., Fuents, M., Sauzet, S., Magnanou, E., & Boeuf, G. (2009). Structural and functional evolution of the pineal melatonin system in vertebrates. Annals of the New York Academy of Sciences 1163, 101-111. Herring, P. T. (1927). The pineal region of the mammalian brain: Its morphology and histology in relation to function. Experimental Physiology 17, 125-147. doi: 10.1113/expphysiol.1927.sp000404. Holzman, D. C. (2010). What's in a color? The unique human health effects of blue light. Environmental Health Perspectives 118, A22-A27. doi: 10.1289/ehp.118-a22. Jain, A., & Bhatnagar, M. (2007). Melatonin – A “magic biomolecule”. Annals of Neurosciences 14, 108-114. Klein, D. C. (2006). Evolution of the vertebrate pineal gland: The AANAT hypothesis. Chronobiology International 23, 5-20. Korf, H. W. (1994). The pineal organ as a component of the biological clock. Phylogenetic and ontogenetic considerations. Annals of the New York Academy of Sciences 719, 13-42. López-Muñoza, F., Rubioc, G., Molina, J. D., & Alamoa, C. (2012). The pineal gland as physical tool of the soul faculties: A persistent historical connection. (English Edition). La glándula pineal como instrumento físico de las facultades del alma: una conexión histórica persistente (Article in Spanish). Neurología 27, 161-168. Macchi, M. M., & Bruce, J. N. (2004). Human pineal physiology and functional significance of melatonin. Frontiers in Neuroendocrinology 25, 177-195. Møller, M., & Baeres, F. M. (2002). The anatomy and innervation of the mammalian pineal gland. Cell and Tissue Research 309, 139-150. Oksche, A. (1984). Evolution of the pineal complex: Correlation of structure and function. Ophthalmic Research 16, 88-95. Purves, D., Augustine, G. J., Fitzpatrick, D., Katz, L. C., LaMantia, A. S., & McNamara, J. O., … Mark Williams, S. (eds). (2012). Neuroscience (5th ed). Sunderland (MA), USA: Sinauer Associates. Rocca, J. (2003). Galen on the Brain: Anatomical Knowledge and Physiological Speculation in the Second Century ad (Studies in Ancient Medicine) (1st ed). Leiden, Brill: The Netherlands, Academic Publication. Santoro, G., Wood, M. D., Merlo, L., Anastasi, G. P., Tomasello, F., & Germanò, A. (2009). The anatomic location of the soul from the heart, through the brain, to the whole body, and beyond: A journey through Western history, science, and philosophy. Neurosurgery 65, 633-643. Sapède, D., & Cau, E. (2013). The pineal gland from development to function. Current Topics in Developmental Biology 106, 171-215. doi: 10.1016/B978-0-12-416021-7.00005-5. Sengupta, A., & Tosini, G. (2017). The pineal gland: A neuroendocrine transducer of light information. In: K. C. Smith (Ed. ), Photobiological Sciences Online. American Society for Photobiology. Retrieved from: http://www.photobiology.info/. [Last accessed on 05 Nov 2018]. Srivastava, K. (2010). Human nature: Indian perspective revisited. Indian Journal of Psychiatry 19, 77-81. Stratmann, M., & Schibler, U. (2006). Properties, entrainment, and physiological functions of mammalian peripheral oscillators. Journal of Biological Rhythms 21 (6), 494-506. Sivananda, S. (2017). The Science of Pranayama. A Divine Life Society Publication. Sivanandanagar Uttarakhand: Sivananda Publication League. Touitou, Y., Selmaoui, B., Lambrozo, J., & Auzeby, A. (2002). [Evaluation of the effect of magnetic fields on the secretion of melatonin in humans and rats. Circadian study]. [Article in French]. Bulletin de l'Acad émie nationale de M édecine 186,1625-1639. Vivien-Roels, B., & Pevet, P. (1993). Melatonin: Presence and formation in invertebrates. Experientia 49, 642-647. Wikipedia –Pineal gland. Retrieved from: https://en.wikipedia.org/wiki/Pineal_gland. [Last accessed on 05 Nov 2018]. Wikipedia –The third eye. Retrieved from: https://en.wikipedia.org/wiki/Third_eye. [Last accessed on 05 Nov 2018]. Wu, Y. H., & Swaab, D. F. (2005). The human pineal gland and melatonin in aging and Alzheimer's disease. Journal of Pineal Research 38, 145-152.